Hadrian Primary School in South Shields has achieved the Inclusive School Award for the third time. Hadrian Primary School is a slightly larger than average primary of 317 pupils It is located opposite Arbeia Roman Fort and heritage site in an area of significant cultural, historical and geographical significance, being close to the River Tyne and coast. The school takes many of its pupils from the Beacon and Bents Ward. A higher than average percentage of pupils, 29%, were eligible for free school meals within the last six years according to census. There is a very high percentage of pupils who do not have English as their first language. Many pupils enter the nursery with little or no language. Hadrian Primary was last inspected in 2008, when it was graded as Outstanding. It has since had an interim assessment in 2011 indicating performance has been sustained. “Hadrian Primary is an outstanding school where pupils make excellent progress.” Ofsted 2008. Hadrian Primary School is an excellent example of inclusive practice in action. The welcoming reception, clear signage, ease of access and positive interaction gives parents and visitors a good first impression of the school. Pupils show respect for one another, for their teachers and visitors. They are proud of their school and of the many ways in which it continuously improves and makes changes to meet their needs and interests. There is a calm, purposeful and happy atmosphere in school and pupils are trusted to make choices and be independent. There was much enjoyment to be seen and heard on the day of the assessment as pupils genuinely enjoyed the company of the adults supporting them; in classrooms, the lunch hall and playground. They have a clear understanding of the Golden Rules, applying the ‘Good to Be Green’ principles within work and play. Pupils say they feel safe and cared for and enjoy participating in the wide range of after school clubs which place no barriers in the way of access. This has a positive impact on attendance. The school uses a wide range of digital resources to good effect. This includes a well-stocked computer suite, iPads, laptops, video cameras, a green screen. The website provides a wide range of online resources linking home and school. The richness of diversity and the many opportunities provided by the community has allowed the school to enhance the curriculum in many ways and celebrate its diverse culture. 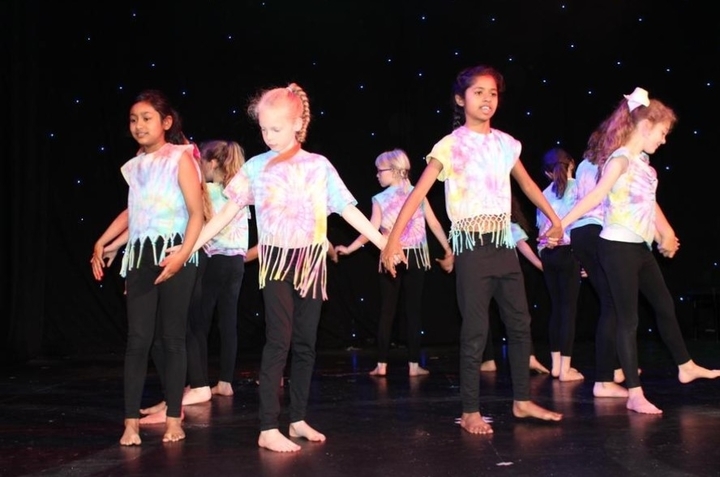 The school hosts an annual Mela, where the local community is brought together to celebrate the Asian festival of music, dance and culture. Throughout the year children will participate in Eid celebrations as well as harvest and Christmas. They observe Remembrance Day, sing carols, showcase performances at the Custom’s House, visit churches, mosques and temples. These are all planned so that pupils can gain a deeper understanding of, and insight into, the customs, cultures and faiths within the community. Displays within classrooms and other learning areas are often stunning and show pupils’ work at its best, providing evidence of the broad, balanced and rich curriculum on offer. For example, a study of Shakespeare gave a focus for learning the origin of English words and phrases and resulted in a wonderful display giving opportunity for pupils to engage in many different types of beautifully presented writing from love letters to journalistic reports. Breakout spaces are tidy and create a sense of atmosphere and immersion in a theme, they draw pupils in and are excellent examples of providing prompts for language development and talk for writing. The spacious outdoor learning environment is imaginatively resourced to suit different interests and has been planned to consider the emotional, social, physical and mental health of pupils. There is a MUGA, Trim Trail, playground games equipment, buddy benches, large field and a quiet garden area. There is a real sense of team play, friendliness and cooperation here as well as full accessibility so that wheelchair users are fully included. Throughout the day, pupils could be seen undertaking roles of responsibility across school; in the role of monitors who helped to prepare classes and set out equipment and as buddies, caring for other children. Those who represent the school body as School Councillors do so with diligence and maturity. Pupils have a voice in Hadrian Primary School. Progress is monitored rigorously and targets are set for all pupils. The Head Teacher and Governing Body use all available data to identify areas in which they can improve and look for ways in which all groups of pupils can be supported to do better. They consistently refine monitoring and evaluation processes to keep a sharp focus on improvement priorities. For example, school leaders recognised the need to improve achievement and progress in Writing across school. Knowing the school well, they identified that to do so they should improve Reading. The subsequent focus on roles and responsibilities, the curriculum and high-quality interventions has led to an increase in the latest average point scores for Reading and Writing. Disadvantaged pupils do well as a result of the impact of targeted Pupil Premium funding. In 2018 the school exceeded National Expectations in Key Stage 2 for all three areas. There has been a year on year improving trend across school culminating in positive achievement across all phases in 2018, demonstrating good progress for disadvantaged pupils. The Head Teacher has a realistic view of the school’s position and the challenges faced and, as a result, children have access to high quality adult support, assistive resources and aspirational targets. Improving pupil progress lies at the heart of the school’s policies and practices. This provision is highly valued by the community and is instrumental in maintaining strong home/school links. Excellent relationships have been fostered with parents who value the opportunities they have to be involved with their child’s learning, for example through workshops, drop-ins and courses. Communication with parents is strong and a variety of strategies is used to achieve this; website, Facebook, Twitter, ParentMail and newsletters all serve to maintain the strong partnership. They appreciate the enrichment which comes from trips and visits, visitors who bring in new experiences in the arts and culture and the many ways in which they can get together to celebrate diversity. There is an active Friends of Hadrian group who work tirelessly to raise funds for pupils and to create a welcome for hard to reach parents through social events. Links with extended services are exemplary and a strength of the school. The school has appointed personnel who can draw on many supportive networks. Hadrian Primary School staff collaborates purposefully to remove barriers to learning, seeking out the appropriate resources, professionals and multi-disciplinary teams to bring about success. Those who are brokered to support do so with diligence and commitment, gaining an understanding of the school community and the individuals within. This results in an extensive range of services from established teams, equipped to address the social, welfare, health and emotional issues faced, thus building resilience. Staff within school are keen to take advice and work upon suggestions offered to create the right climate for success. There are close links with local schools with a view to sharing best practice, supporting with moderation, teaching and learning and transition to the benefit of all. Hadrian Primary misses no opportunity to find partners within its locality, strengthening relationships and promoting community cohesion. The curriculum is enriched through participation in memorable learning experiences, supporting the personal development of pupils. This also helps to contribute to many awards the school has achieved over time, which raise aspirations and of which all stakeholders are rightly proud.